I am a huge advocate of reading to your children. Reading to your infant or toddler is not about trying to create a genius of a baby. This post contains affiliate links. It is about helping your child reach her own innate potential (see The Read-Aloud Handbook, page 50). Despite the recent story that reading to children gives them an unfair advantage (just don’t even get me started on that idea), I continue to fully support and encourage parents reading to their children daily. Rather than telling parents who read to their children that they should occasionally feel guilty about the unfair advantage they are bestowing on their children, let’s encourage parents who aren’t reading to their children to do so. “Children hearing the most language will have the best chance of having the best language skills” (The Read-Aloud Handbook, page 50). I would love to see all children given this chance and opportunity to reach their full potential. It isn’t about being “better” than others; it is about being the best version of themselves. Keep in mind that “…attention spans are not built overnight–they are built minute by minute, page by page, day by day” (The Read-Aloud Handbook, page 52). And by the way, that is a fantastic thing to keep in mind for all sorts of parenting activities and issues from discipline to chores. For me in this age range, a huge part of why I read to these young ages is to start a habit and to foster a love for books. I want my children to have positive associations with reading and books, so always keep that in mind as you are reading to your little ones. What you read to this age group is not important. It just matters that you are reading (The Read-Aloud Handbook, page 49). 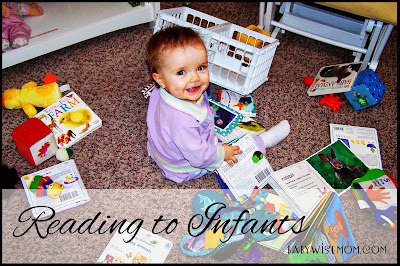 With my little ones, I read books geared toward babies, but you could read the newspaper. You could read aloud a book you are interested in. You could read aloud your scriptures. Just read out loud. These young babies can’t move on their own, so really your baby has no choice but to listen. I like to read with baby on my lap, but if your baby gets squirmy and upset, go ahead and put baby on the floor and read. You could read during tummy time or while baby was at the gym. You could lay on your backs next to each other while you hold the book above you. Again, go for your number one goal to be that you hold your baby while reading. Don’t restrict your baby, but cuddle your baby. Around 4 months old, babies start to have an interest in toys. By 6 months old, your baby will want to grab the book. A great idea is to let your baby hold a toy to chew on so the book doesn’t become a battle. A wise thing for these younger ones is to read board books rather than books with pages that can be ripped when those cute pudgy fingers grab hold of them. Sometimes you can even give baby a different book to hold while you read a book. During these months, the child will grow more and more interested in helping turn pages. The child will also grow more and more interested in the book. You can start asking your child to point to certain things. You can point at things and ask, “What is that?” or “What sound does a pig make?” Of course, you will have needed to introduced those things before asking your child to answer those questions. Your child will start by mimicking the things you teach and will progress to being able to answer questions. Val – I read your blog everyday and I've never left a comment. I should take a moment to thank you so much for all of the wonderful advice you have given me since I became a mom 2.5 years ago. But, I couldn't read this article and not comment. I was shocked and horrified to read the article in the link about "unfair advantage." I can't believe that parents who read to their children should be made to feel guilty or have someone suggest they'd be better off in a government institution. I read to both of my children before every nap and bedtime. And I'll be increasing that reading time tonight. Take that, Plato. My daughter is 11 months and has never wanted to sit and read books! This is so strange for me, since my son was loving books as soon as he was old enough to sit up! I do try to read to her everyday, but I stopped trying to do it right before bedtime (it just wasn't worth that battle!) and I try to do it during playtime and also in the evenings before her bath. Our biggest issue is that she just wants to close the book. Usually what happens is I start to read a book, and by the end of the first page she is trying to close the book. I can usually get through about 4-5 pages before she crawls out of my lap and starts pulling the rest of the books off the shelf. She then opens and closes them while I finish reading the book. I figure while it is not picture perfect, it is the best we can do for now!! Our biggest success comes when I read Sandra Boynton's books (Moo Baa La La La, Barnyard, Dance, Snuggle Puppy, etc.) because there is always some rhythm and rhyming, the pages are usually short, and they are always board books. Jenn that is definitely a challenge! Keep up the work and effort. Her hearing you read is better than nothing for sure.